The soprano Jenny Lind was the illegitimate child of bookkeeper Niclas Jonas Lind and schoolteacher Anne-Marie Fellborg. Her mother had divorced her first husband but only married her father when her former husband died. Jenny was fourteen at the time. When Jenny was nine she was overheard singing by the maid of a mademoiselle Lundberg, who was an important dancer at the Royal Swedish Opera. Lundberg helped her to enter the acting school of the Royal Dramatic Theatre. She debuted at the opera in Stockholm in 1838 as Agathe in "Der Freischütz" by Weber. Succes came quickly and she became court singer to the king. But her voice was damaged because she used it too much and was inadequately trained. It was saved by Manuel Garcia, with whom she studied in Paris from 1841 to 1843. After she was rejected at the Opera of Paris she returned to Stockholm. She toured in Denmark in 1843 and there she met Hans Christian Andersen. He fell in love with her, but she wanted to be no more than good friends. In 1844 she made a succesful tour in Germany and in from 1847 to 1849 she toured in England. She had become a close friend of Felix Mendelssohn and was shocked by his early death in 1847. In 1848 she spent a lot of time with Chopin when he was in London and there were rumours of an affair. In 1850 she sailed to the USA where she toured extensively. There she married her pianist Otto Goldsmidt in Boston on 5 Feb 1852. In May 1852 they returned to Europe. First they lived in Dresden but in 1855 they moved to England where they lived for the rest of their lives. In 1853 a son, Otto, was born and in England in 1856 a daughter, Jenny, and in 1861 another son, Ernest, followed. Back in Europe she didn't sing in opera's anymore and restricted herself to concert halls. In 1882 she was appointed professor at the new Royal College of Music. There she taught until 1886. During the last years of her life she lived at Wynd's Point in Great Malvern. There she died in 1887. 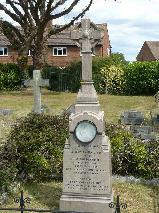 Her husband lived until 1907 and was buried beside her in Great Malvern. Her nickname was 'The Swedish Nightingale' and according to some she was the best singer the world had ever heard. Unfortunately there exist no recordings of her voice. 11/9/1850 Jenny Lind makes her American Debut in New York City . At the Castle Garden Theatre in New York City. 20/10/1870 Last public performance by Jenny Lind at Düsseldorf. She sang in "Ruth", an oratorio by her husband, the pianist Otto Goldschmidt. The grave of Jenny Lind at the cemetery in Great Malvern.